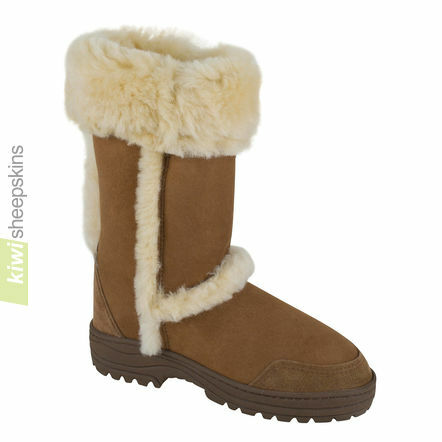 Our own special version of our ever-popular, New Zealand-made, luxury sheepskin boots range, featuring contrasting spilled wool sheepskin on all four of the seams, including the rear seam. These 'exposed seam' boots have been very popular. Comments from customers who purchased these boots from us. Just wanted to let you know that I received my Spilled Wool Tall Ultimate boots this morning, just a week after placing my order - brilliant service. I am absolutely delighted - the boots are fantastic, fit perfectly (thanks to your clear instructions on choosing the correct size) and feel sumptuous and snuggly on my feet. This is my first pair of sheepskin boots, having resisted until now because of the price of other brands in the UK, not to mention the stories about dubious quality and fakes. Your company is to be complimented on all levels: service, product quality, price and a wonderfully comprehensive and informative website, especially the sizing guide and testimonials, both of which played a large part in my decision to use your company. I will definitely be spreading the word and recommending you to all my friends. Thank you from a very satisfied customer. Wow thanks so much for the sheepskin boots..Shipping was super fast...Oh they are fantastic, excellent quality. Wore them yesterday and I must say I did not want to take them off, they are so snug and cosy, my feet love em...The sheepskin is so thick, great rubber shoe soles too. These boots are excellent quality...I know I will get many years wear out of these...The price was brilliant too. I have seen so many poorly made ugg boots I could not believe your price, there are some made in China that sell for the same price as yours but I must say your boots are of better quality by a mile....Yes your company is highly recommended, now when someone asks where do I get a great pair of ugg boots I know where to send them.....Thanks again they are so beautiful. I just wanted to write and say how pleased I am with your boots which I've been wearing every day since they arrived. Luckily I got them just in time for the big snow here in London! The thick soles have amazing grip in the snow and the boots are so warm. 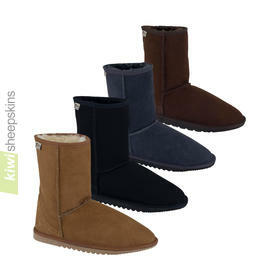 The wool is much thicker than UGG and the other commercial brands we're offered here and the removable insoles are a great way to make the boots last longer. I've recommended your boots over and over. Great value. I received my order today thank you. My boots are a great fit and excellent quality. Much better than the over priced Uggly boots here in Oz. I am reluctant to take my boots off, even to go to work. Thanks again for excellent service and product, I will be recommending you to my mates!! My spilled wool boots are gorgeous, these can stand up on their own, unlike a famous American brand! 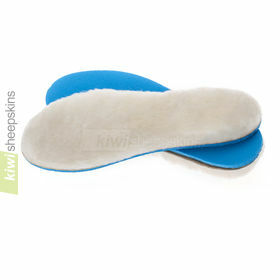 The insoles are twice the thickness! What's more, they are so much cheaper. Higher quality at a lower price with first class service - what more could a customer want. Thank you very much. I just wanted to say I ordered a pair of boots for my mum literally a week before Christmas and they arrived just in time. Now both my mum and I have a pair and she's really over the moon and can't believe how much better quality the wool is compared to some makes here in the UK. So on behalf of my mum I'd like to say thank you so much. I would like to send my thanks for the service & the boots that I received from you. They are a birthday pressy for me on the 22nd but managed to talk hubby into letting me have them straight away. I can see these on my feet more than off. I'm soon off to buy some jeans that will good with them. I will recommend you to all that ask about them. I have already been told that they are nicer than the sought after other designer brand. I'm saving up already for another pair. I look forward to a winter with warm feet for the first time. Thank you so much. I would just like to thank you for my order received recently. 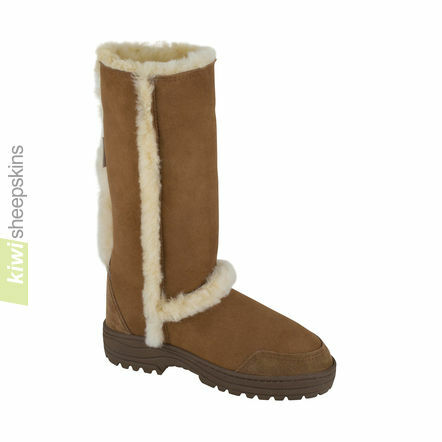 The boots are absolutely wonderful; so soft and light and extremely warm and comfortable - it's like walking on clouds! My boots have become my 'best friend'! The slippers are a Christmas present for my mum and I am sure she will be absolutely thrilled with them! Thank you. I am just going back onto your website to see what else I can treat myself and daughters to! Thanks again. I absolutely love my boots. I almost purchased a different well known brand but came across Kiwi's web site and just knew that your items would be what I truly wanted. Quality product, honest prices and wonderful customer service - Kiwi has made me a very happy customer!! I will be ordering another pair soon for my 16 year old daughter! Thank u sooooo much! I am positive my friends will be placing orders also: )!! Thanks so much for my beautiful boots, received today (less than a week from ordering). Am now saving up for a black pair. Excellent service. Thanks and best regards from a very happy Jane. I was so excited today when I got to the post office. The parcel from NZ was there....... The boots are exactly what they appeared to be in the photo and the sizing chart that you provide is spot on. An excellent fit... Thank you so much for the lovely service and product. Many thanks for my lovely boots, they arrived so promptly after they were shipped, and best of all they arrived on my birthday!!!! They are so comfortable and look brilliant. Will be recommending your web site to all my friends. A HUGE THANK YOU! These boots are just superb. Exceptional quality and value - a slice of heaven for my feet! I can't believe that they were here in less than a week - ordered Monday night delivered Saturday! I will be searching for another style as well, because you can never have too many boots!!! Many thanks to you all - a magnificent service all round. I *always* have cold feet...fact of life. I received my beautiful boots yesterday, & haven't had them off my feet since (except for bed)! The quality (and price) is amazing. There is certainly nothing in the UK to touch them! and....my feet have been warm all day for the first time in years (and I don't exaggerate!) Wonderful, warm & very fashionable...I couldn't ask for more. I am enjoying the boots, they are fantastic! It is hard to find high boots that fit my calf, and yours are great! I received my order in 7 calendar days during the holidays. Very impressed with Kiwi! Just wanted to say I received my boots this morning, amazingly quick shipping and the boots are great. They fit perfectly and will keep my feet cozy after freezing in the chilly sea over in here in the UK! Will certainly recommend and use your site again. Many thanks. Just a quick note to say thanks for such fast delivery! The boots are fab, great quality and a great price. 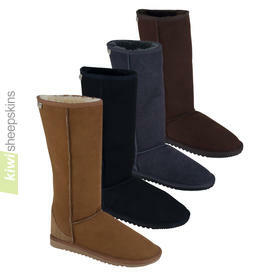 Will definitely recommend you to all my UGG loving friends!